Make a bold statement with bright red twin loop wires. This shade matches most business reds, so it will compliment your title or logo easily. We carry three different brands, all high quality products that are durable and attractive: GBC, Renz, and our own MyBinding brand. There's 3:1 and 2:1 binding. The 3:1 pitch is used for sizes 1/4" - 9/16" and the 2:1 pitch is for sizes 5/8" - 1-1/4". 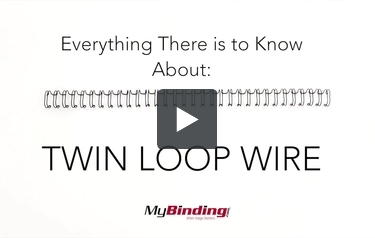 We offer various lengths of wires plus the option to get a spool of twin loop wire, for custom lengths. Just make sure the wires you choose will work with your machine. Premium red 2:1 twin loop wire.